Robert Allenby was one of six players to card 65 in blustery conditions in Honolulu. 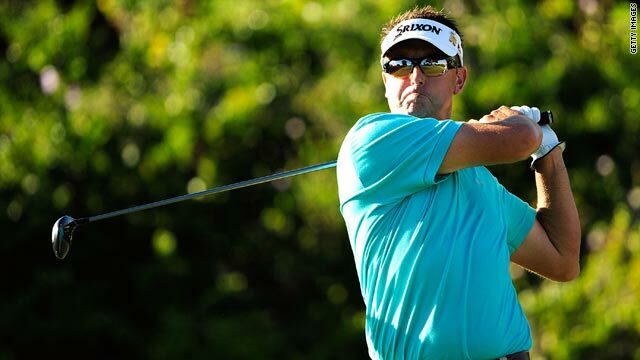 (CNN) -- Robert Allenby overcame an ankle problem to claim a share of the lead after the first round of the Sony Open in Hawaii. The Australian suffered the injury after falling of a curb in Honolulu earlier this week, but still managed to fire a five-under-par 65 in his first PGA Tour appearance of 2010. He was joined at the top of the leaderboard by five other players despite windy conditions at the Waialae Country Club on Thursday. His score was matched by former Masters champion Zach Johnson, Davis Love III, John Merrick, Ryan Palmer and PGA Tour Qualifying School winner Troy Merritt. They were one shot ahead of a group of 10 players including current Masters champion Angel Cabrera of Argentina, world No. 3 Steve Stricker, Sweden's Carl Pettersson and former U.S. Ryder Cup captain Tom Lehman. "I twisted my ankle on Monday and didn't know whether I was going to play, tried it out yesterday and sort of scraped it around the golf course," Allenby told reporters. "I kind of did the same things today really. It's all a bit abbreviated, the old swing, but the short game's good and that's what counts. You need that when you're not 100 percent." British Open champion Stewart Cink was further back in another big group of 11 tied on two-under along with South Africa's Rory Sabbatini and Japan's Ryuichi Oda. Former world No. 1s Ernie Els and Vijay Singh were among those another stroke back alongside two-time major winner Retief Goosen. Meanwhile, David Lynn is set to take a one-stroke lead into the third round of the European Tour's Joburg Open in South Africa after Friday's action was halted by bad weather with 30 players still out on the course. The Englishman, who has won only once in more than 300 starts, followed up his opening 63 with a four-under-par 67 at Royal Johannesburg and Kensington East. He was five shots clear of compatriot John Parry and South Africa's Andrew Curlewis, who were the highest placed of those yet to complete their rounds, each with three holes to go. Home favorite Charl Schwartzel, also one of four players to score 63 in the first round, was second on 11-under after a 68. Irishman Darren Clarke, seeking to regain his place in Europe's Ryder Cup team this year, was tied for third on 10-under after a 69.